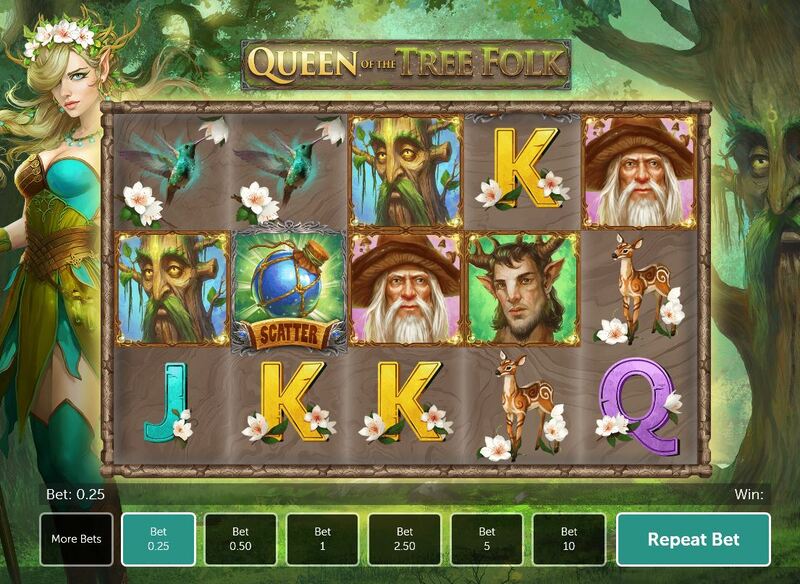 Queen of The Tree Folk slot developed by UK-based company Gamesys. Like most of their slots it is a 'monofeature' game, my term for slots that have but one in-play or bonus game. 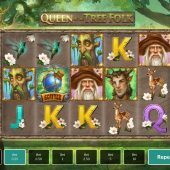 The theme is similar to IGT's Pixies Of The Forest slot, but maybe slightly darker in that some faces are embedded in the trunk of a tree or in branches. You do still get the beautiful fairy character though! The background music is very gentle and shouldn't detract from the game. The symbols are all single and the highest-paying is the Fairy Princess at 60x stake for 5-of-a-kind down to the lowest card symbol the Jack at 4x stake. There are non-multiplying Wilds on the centre 3 reels in the form of primroses. Scatters appear on all reels and when 2 of them land you get the obligatory 'heartstopper' slow spin on the remaining reel(s). The 5th. reel also spins slowly should any 4-of-a-kind win land, keeping you in suspense in anticipation of a 5-reel prize. Three or more Potion Bottle scatters will trigger a free spins bonus, which may also be retriggered. You do get to choose the variance of the bonus though by opting for 15 spins with a 3x multiplier, 10 with 5x or 5 spins but with a decent 10x multiplier. Landing the best 5-of-a-kind could therefore net you 600x stake if you are brave enough for the 10x option!